We are now accepting new applications and renewals for the 2018-19 membership year. Your membership will be valid for 1 year from July 1, 2018 to June 30, 2019. Current members of PSC: You should have received an email from EntryEeze prompting you to renew. If you did not receive an email that means we do not have your current email address in our system and you will need to update your email address. New members of PSC: Please select “Apply for membership” to begin the new membership process. 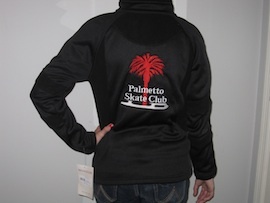 Members of the Palmetto Skate Club may purchase customized jackets. Palmetto Skate Club jackets will have 3 order times throughout the year. March 1-15, July 1-15 & November 1-15. Click on the Merchandise tab to order your club jacket.